Recently, we took the opportunity to recognize the valuable role that agriculture plays in protecting clean water in Pennsylvania. At an event on May 11, we celebrated our partnership with the Pennsylvania Departments of Environmental Protection and Agriculture, which has reduced pollution in the Chesapeake Bay watershed. 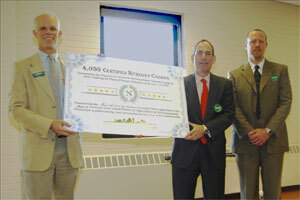 At our May 11 event, we had the pleasure of presenting 4,036 Certified 2010 Nitrogen Credits to Secretary Michael Krancer of the Department of Environmental Protection and Michael L. Pechart, Executive Deputy Secretary of Pennsylvania’s Department of Agriculture. These tradable credits, generated by farmers in the Susquehanna Watershed, can be used by jurisdictions in the state to meet limits on pollution allowed in the watershed. Agriculture is central to the culture and heritage of Pennsylvania. The vibrancy and passion behind efforts to protect farms and farmland in the state have deep roots, resonating beyond the fields to lawmakers and industry leaders, local consumers and small business owners. The story of farming is one about the men and women who work every day to grow the food we eat. But they provide so much more to us. They provide jobs—both on the farm and in the community—in processing, transportation, at farmers markets and grocery stores, and in other local businesses. Their work places—we call them farms— provide such beauty to the landscape that people travel to Pennsylvania just to see them. These farmers are also stewards of the land that can protect our water, wildlife and air quality. Water quality is of particular interest in central Pennsylvania, where numerous rivers and other tributaries are part of the Chesapeake Bay Watershed. While there are many threats to clean water, including industrial pollution, waste treatment plant discharge and urban run-off, certain agricultural practices also can contribute to water emissions. But proven farm conservation practices—called best management practices—that many farmers already utilize are among the most cost-effective ways to help protect water. However, farmers face barriers to adopting these practices, including cost, concern about loss of income, lack of guidance or financial assistance, and a lack of clarity on the exact requirements for implementing the practices. We work in a number of ways to help farmers address these barriers to improving their land stewardship. Our BMP Challenge, an innovative risk-management program, allows farmers to test, on their own land, practices for reducing fertilizer run-off. We’re also helping establish water quality trading markets that allow famers to earn a profit from pollution reductions on their land, which typically cost less to implement than equivalent reductions made by industries or urban communities. Our program in Pennsylvania is designed to bring these two innovations together. Since 2006, participating farmers in our BMP Challenge in Pennsylvania have collectively reduced fertilizer applications significantly, keeping about 60,000 pounds from running off their fields and into the Chesapeake Bay. We recently worked with eight farmers and the Department of Environmental Protection on a “trial run” to see how well the department’s system for calculating credits functions and to determine if a trading market could financially benefit farmers who adopt conservation practices that reduce both fertilizer and sediment run-off. At our May 11 event, we highlighted the success of the pollution reduction efforts of Pennsylvania farmers and the partnerships needed to move these much needed farm conservation practices forward. We also recognized that these efforts are not only about stewardship, but also about the economics of maintaining thriving agricultural enterprises. Supporting a viable future for our farms will ensure our continued access to abundant, healthy food; a connection to the roots of our history and culture; jobs and a solid base for our rural communities; and clean water, today and in the future. That is certainly something we all can celebrate. This entry was posted in In the News, Pennsylvania, Water Quality and tagged Best Management Practices, Chesapeake Bay, conservation, nitrogen, Pennsylvania agriculture, Water Quality, water quality trading on May 24, 2011 by Jim Baird.